Do you want to be part of a public speaking course like no other on this planet? During the last seven years David JP Phillips has been studying 5000 speakers all over the world to distill the common skills that make a speaker brilliant! The end result was 110 unique skills. One year later a digital platform, called www.speakerrating.com was built based on these 110 skills making it the world’s most advanced coaching platform for public speaking and presentation skills. And this is the course that will take you through every single one of those steps; giving you a growth opportunity never never before possible.Before your 4 day training you will be asked to upload a video of yourself delivering a presentation. David JP Phillips will then measure your 110 skills and give you a score using www.speakerrating.com. Based on that score, he will assist you and the whole group through all the 110 steps – he will train you, coach you and challenge you until the skills become part of you. You will get a communication profile on www.SpeakerRating.com, your personal “SpeakerProfile” which will define your score on 5 categories: your credibility on stage, your self confidence, the clarity in which you present your subject, your ability to create focusin your audience and your presence. All of these 5 categories will be vastly improved during the training. During your training, David will use several different disciplines: Spontaneous presentations, Storytelling, PowerPoint delivery and speeches. Don’t worry if you feel uncertain about any of the techniques. David will go through them all during the training. What is absolutely astoundingly impressive with the 110-steps course is that it will not only impact your performance on stage but it will also affect every single communication situation you have in your life, i.e. it has the possibility of making you a better parent, partner, business developer, sales person and leader. 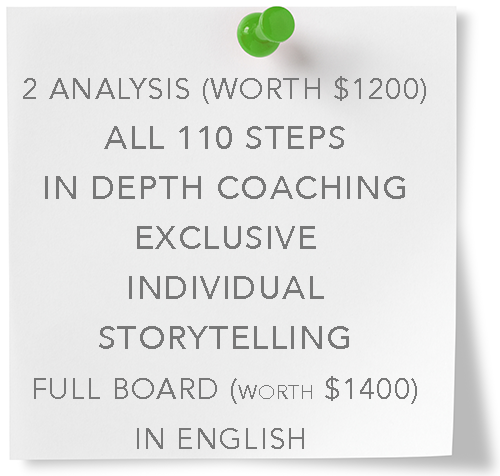 Two complete analysis on SpeakerRating.com are included in the course for a total worth of $1200. One analysis will be done before the training and one afterwards. This here, is the entire version of the course. There is a short 2 day version offered in Swedish as well, the main difference between them is the level of depth on each step, the time for practice and the amount of coaching. Nothing specific, however, having some experience of presenting and public speaking is beneficial and that your nervousness of presenting is not too bad. What is unique about this course is that anyone who wants to become a better presenter, public speaker or even communicator is able to attend. This is a course where there is an opportunity for the pro’s and the amateurs to meet and connect. After the end of the course your life will never be the same, the new pair of glasses you will be wearing will give you a new perspective on all your own presentations. You will feel much more secure, present and clear in your delivery and you will know what you can do to become as good as you imagine. The language will be English. If you are not entirely fluent in English you may also deliver approximately 30% of the exercises in your native language, specifically the body language exercises. The platform is spreading around the world and we will need to increase the amount of coaches and the languages of each coach. In order to become a coach you will need to have completed this program and then a coaching program for 3 additional days. The 18 language techniques that can make anything you say powerful.